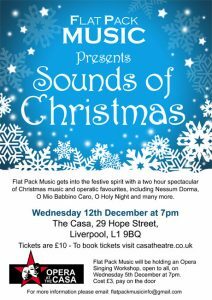 Professional opera company ‘Flat Pack Music’ are back at The Casa for a two-hour Christmas spectacular of opera and festive songs including ‘Nessum Dorma’, O Mio Babbino Caro, Holy Night and many more! Join us for the perfect way to get into the festive mood. 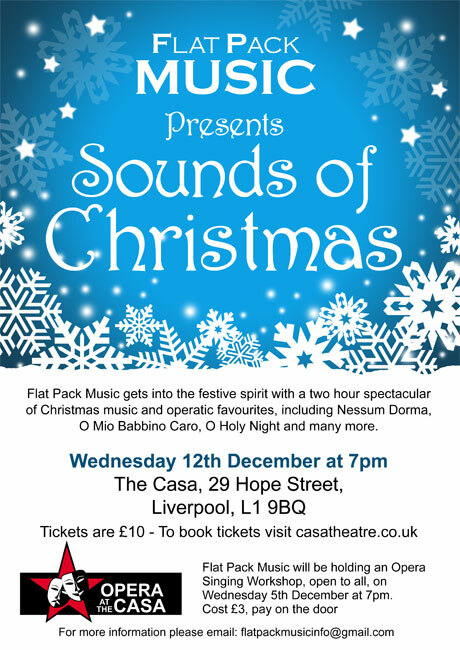 Please note that Flat Pack Music will also be running an ‘Opera Singing Workshop’ on Wednesday 5th December, 7pm also at The Casa which will give participants a taste and introduction to opera singing. The workshop is open to all from total beginners to those with some experience. It costs £3. There is no need to book, just turn up on the evening and pay on the night.